ORANGE BEACH, Ala., July 14, 2015 – Dennis Pastentine and his veteran team aboard Re-lentless Pursuit, a 95 Jim Smith based in New Orleans, Louisiana, are the 2015 Gulf Coast Tri-ple Crown Champions. Captain Robbie Doggett is the skipper, with Michael Akiu and Jerry Mor-rison as mates. Relentless Pursuit started strong by winning the Cajun Canyons Billfish Classic and competed in all five events that comprise the series. 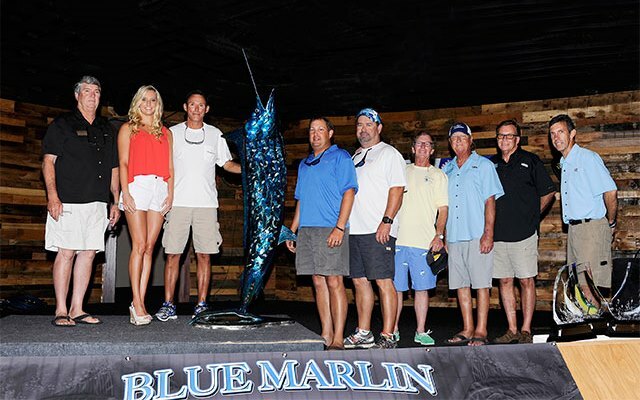 The Grand Marlin Restaurant and Oys-ter Bar and Gulf Coast Yacht Group were the 2015 Presenting Sponsors. Pastentine caught the winning blue marlin, a 508.1-pounder during the Cajun Classic and also took top release honors by adding four blue marlin to his overall tally. During the Emerald Coast Blue Marlin Classic in Sandestin, he released a blue and two white marlin. The boat also fished hard in the other qualifying events, including the Orange Beach Billfish Classic, the Mississippi Gulf Coast Billfish Classic and the Blue Marlin Grand Championship. By competing in all events, Relentless Pursuit earned bonus points which proved to be the difference. Rise Up, a 54 Viking owned by Rusty Skalla, was the first runner-up in the 2015 series. Rise Up was the top boat of the Orange Beach Billfish Classic after weighing a 502-pound blue marlin. Capt. Jason Hallmark is the skipper of the Destin-based sportfisher. Owner/captain Johnny Dorland and his team aboard Cotton Patch, a 60 Hatteras based in Or-ange Beach, Alabama, came in third in the points standings. Cotton Patch outlasted a blue marlin weighing 899.6 pounds in the Emerald Coast event to take first place. As a new tournament record, the team also received bonus points in the Triple Crown standings. The Triple Crown is scored on a hybrid system that includes both weight and release points for the top three finishes in the blue marlin divisions only. Bonus points are also accrued for series participation and tournament marlin records. Dana Foster and Capt. Myles Colley on Born2Run made a late run at the crown, only to come up a little short. The 63 Hatteras won third place in the Blue Marlin Grand Championship based solely on release points, but Relentless Pursuit’s early lead was too much to overcome. The other teams in the Championship race included past two-time champion Done Deal, You Never Know! and Ono Ocean. Fishing partners Palmer Long and Bob Sossaman were so determined to compete they chartered a boat to fish Emerald Coast when the Ono Ocean broke down. For their efforts, they were awarded the Busted Piston hard-luck award at the BMGC. As Triple Crown Champions Relentless Pursuit won a six-foot custom marlin sculpture by ma-rine artist Frank Ledbetter and bragging rights for the competitive Gulf tournament circuit.